Volkswagen will begin taking orders for the Street up! and Club up! today, ahead of first deliveries in March. Both models are based on the flagship High up! trim which includes front fog lights, heated front seats and a Maps & More portable infotainment device, however, the Street and Club up! are loaded with more styling features for only an extra £610. The stylish Street up! adds 16-inch Upsilon alloy wheels, standard Pure White, Black Pearl or Reflex Silver paint, 65 per cent tinted glass from the B-pillar back, “Street” badging, decals on side, bonnet, boot and roof, wing mirrors in silver (except for the Reflex Silver models on which they are black), body coloured bumpers with chrome moulding on the front fog lights, leather steering wheel with up! logo, up! scuff plates with yellow stripe, black roof lining, carpet mats and unique “Street” cloth upholstery. The sophisticated Club up! adds 16-inch Triangle alloy wheels, standard Blueberry metallic (unique to the Club up!) or Black Pearl paint, 65 per cent tinted glass from the B-pillar back, “Club” badging, decals on side panels in silver, wing mirrors in silver, up! scuff plates, black roof lining, carpet mats and unique “Club” Tartan Tonic cloth upholstery. Both new cars are powered by the up!’s most powerful 1.0-litre petrol engine. Delivering 75 PS at 6,200 rpm, the three-cylinder engine is mated to a five-speed manual gearbox. It returns 60.1 mpg on the combined cycle and emits 108 g/km of CO2. The up! produces a maximum torque of 95 Nm (70 lbs ft) between 3,000 and 4,300 rpm. The Street up! and Club up! are available to order in three and five-door bodystyles. The up! range starts at £8,765 (RRP OTR) for the entry-level 60 PS 1.0-litre Take up!. 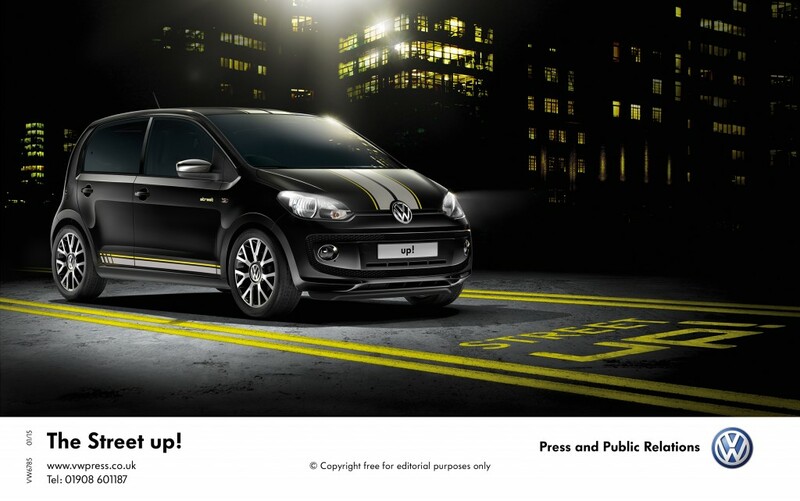 This entry was posted in Car Updates & Releases, Cars, New Cars, News and Views, Small Car and tagged lease the Volkswagen up!, UP!, Volkswagen, Volkswagen up by David Petherick. Bookmark the permalink.